Two Cartes de visite depicting Emma Estelle Drayton as a young girl of seven years and as a young woman. 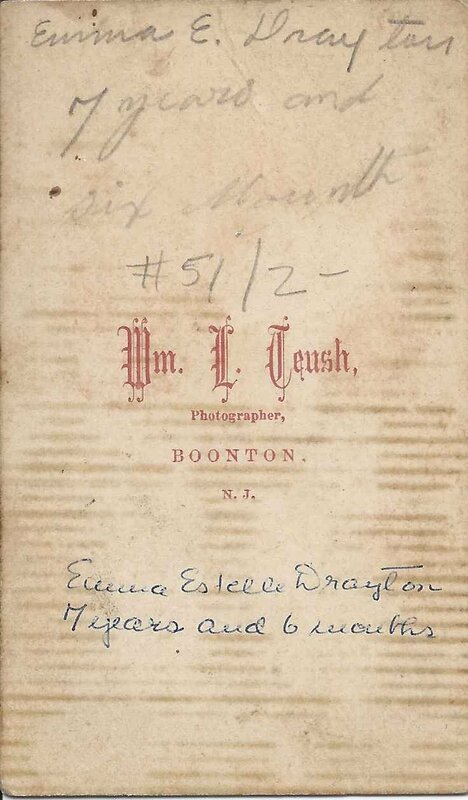 The CDV above was produced by William L. Teush of Boonton, New Jersey. 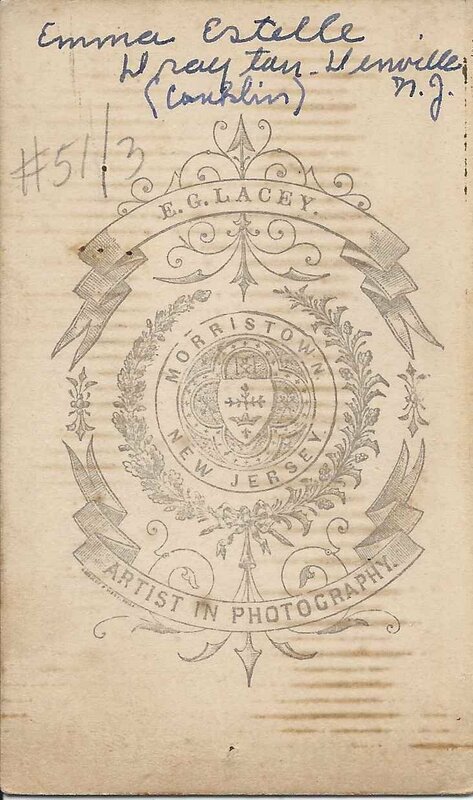 The identification on reverse, below, shows twice, one a more contemporary one. 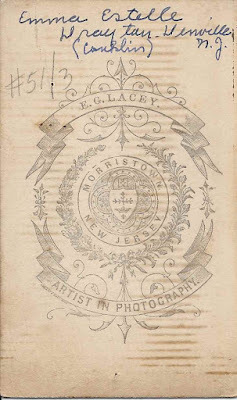 The CDV of an older Emma, below, was produced by E. G. Lacey of Morristown, New Jersey. 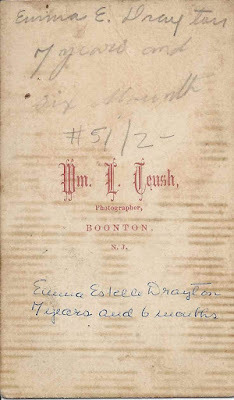 The identification on reverse shows her married name of Conklin in parentheses. 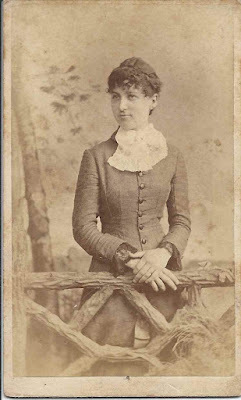 Emma Estelle Drayton was born 1 February 1863 at Rockaway Valley, New Jersey, the daughter of William Henry Drayton and Jane C. (Tunis) Drayton, both born at Rockaway Valley. Emma's paternal grandparents were Esau and Agnes (Glass) Drayton. Her maternal grandparents were Joseph M. and Charity (Hill) Tunis. On 13 March 1881, Emma married Willard W. Conklin. The couple had at least two children, possibly three. I found a reference online to various Bible records collected over the years, with a few records referring to the Drayton and Conklin families. The reference mentioned an H. Mabel Conklin, born 1 November 1882 and an A. A. Conklin, born 5 November 1884. 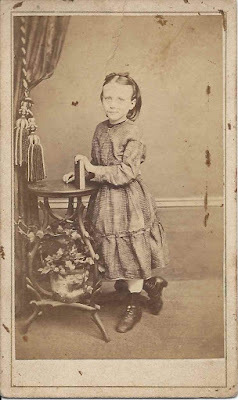 New Jersey Births and Christenings, 1660-1980 shows an unnamed female child of Willard and Emma born or christened on 1 September 1883. The 1900 Census of Asbury Park, New Jersey lists Willard, Emma and daughter Aura; Willard was working as a manufacturer of ice cream. On 7 October 1907, Aura Mabel Conklin married Charles Russell Wharton. See an earlier post for a photograph of Charles Russell Wharton's mother, Caroline (Apgar) Wharton. In the 1910 Census of Keyport, New Jersey, Willard and Emma are listed living alone. Willard was a clerk at a grocery store; no occupation was shown for Emma. By the time of the 1920 Census, Willard and Emma were at Wall Township, New Jersey; no occupation is listed for either of them. Emma died in early 1930. By the time the Census was enumerated that year, Willard was back at Keyport and had married Gertrude Badgeley. He listed his occupation as proprietor of a grocery store. Willard died in 1936.